When South Terrace on Littlehampton seafront was flooded in 2012, residents were told it would be a once in a century event. But just six years later, it has happened again – and now they are calling for compensation. The flash floods on Bank Holiday Monday, May 28, brought misery to scores of residents and businesses in the town centre. They lost thousands of pounds worth of possessions, and their floorboards will need replacing – made worse by the fact they found out their insurance does not cover flooding. The music teacher said he would have to watch his prized £8,000 piano ‘die a long slow death’ after getting wet. 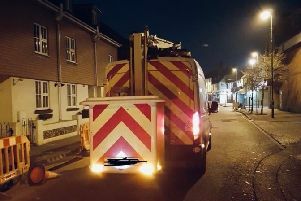 While Southern Water gave residents dehumidifiers and disinfected their properties, the 39-year-old and his neighbours believed they were to blame for the flooding because the pumps to clear the sewers were not working. Lucy Birkinshaw, 49, said her basement flat had ‘absolutely no security’ because she had to leave her window open for a pump to drain the space by her front door, which was waterlogged. Yasmin Hassan, 41, has lived in her basement flat since 2003 and had to rebuild her life when it was filled with three feet of water mixed with sewage in the 2012 floods. This time, her bathroom and outbuildings were flooded. They said the stations that serve South Terrace are fitted with automatic pumps, which performed correctly during and after the deluge according to their tests. No ammonia was in the flood water samples they tested, meaning any sewer flooding was ‘diluted significantly’ by the rain. Since 2012, Southern spent £300,000 upgrading three storm pumps at their foreshore pumping station, and building a mini-pumping station in Pier Road in 2013. Decisions about compensation would be made depending on levels of rainfall, Southern Water said. For more information about their compensation policy, click here and here. Anne Kenny, whose flat was flooded, claimed the drains were clogged with grass cut from East Green. Arun District Council said it is meeting with all the partner agencies and local businesses to see how they can prevent flooding in future.